Recently opened in the 108-year-old Free Methodist Publishing House building that once housed a casket factory in the West Loop, this intimate 70-seat wine bar offers a relaxed vibe and cozy clubhouse feel that’s already made it a Chicago winter bar favorite. Located in the basement of The Publishing House B&B with a massive yet unpretentious list of 60+ wines as well as small plates like caviar and lamb meatballs, it’s the perfect place to learn about wine without feeling like you’re being forced to sit through a class taught by insufferable wine snobs. Instead, further your education the right way: by drinking. 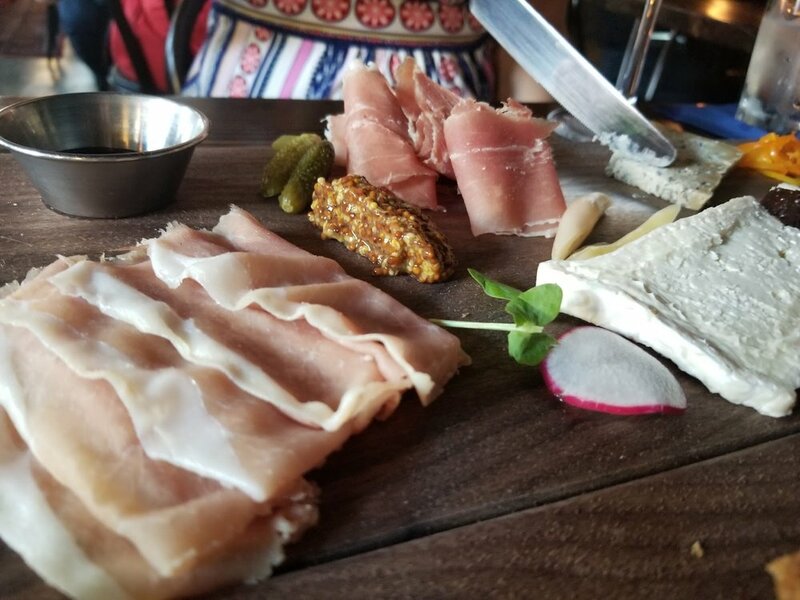 A carefully curated cheese board pairs beautifully with wine offerings at The Press Room. WEST LOOP — With the hustle and bustle of Randolph Street and some of the city's top restaurants just one block north, the Press Room had to find a way to stand out. So the new wine bar, which opened last week at 1134 W. Washington Blvd., focused on becoming a place for neighbors to unwind for a few hours and get away from the chaos. "I really want it to be a relaxed, easygoing place," said owner George Saldez. "There's obviously a lot of great places nearby, so I'd like to think of this as somewhere that's really local." The 70-seat wine bar is located on the lower level of a 108-year-old building that began as the Free Methodist Publishing House. It later became a casket factory before spending decades as the Museum of Holography until 2009. Sitting below a bed and breakfast in a century-old Methodist publishing house, this subterranean West Loop bar presents a generous wine list with New American comfort food plates. The vintage vibe with news-centric and photographic decor pay's fitting tribute to the locale's history. An evening of live music at The Press Room is featured on the Podcast about life and activities in The West Loop and Fulton Market neighborhoods of Chicago. Tucked away in a West Loop basement, the Press Room offers you a cozy refuge from the neighborhood hustle and bustle... this wine bar makes you feel like it’s been around for ages. Nestled in the basement, large windows offer passersby a glimpse of the European cafe culture inspiration. While the Press Room offers an assortment of wine to choose from, you don’t have to know much to enjoy the spot. With its broken-in vibes, it’ll make a run for your favorite friendly neighborhood hangout spot. 'Wine is not about whether you know more than the next guy.' New wine bar wants you to relax, drink, enjoy. Splashy new openings are a dime a dozen, but I’d like to give a shoutout to cozy spots that fly under the radar but pack a wallop. You know the ones: a subdued atmosphere, easygoing snacks, interesting drinks that don’t require too much thinking. A place you’d feel comfortable hanging solo while reading a book, but that can equally double as a spot to take your Tinder date or visiting family. Tour This New West Loop Wine Bar, Now Open Inside a 109-Year-Old Building. The ownership of The Press Room have transformed the basement of a 109-year-old building at 1134 W. Washington Blvd. into a 70-seat European-style wine bar. The new bar isn’t the only wine bar in the West Loop, as the neighborhood already is home to The Lunatic, The Lover, & The Poet, City Winery, and Bin 36. However, owners hope a laid-back vibe, 80 wines, and dishes like a savory pie stuffed with short rib can set them apart.